Samuel Johnson life of tragedy sits behindthe facade of fame. Behind the success and fame, Samuel Johnson's life has been marred by loss. As Samuel Johnson picked up his gong for most Popular Personality on Australian Television last weekend, most knew him as a multi-faceted Australian actor navigating the murky and sombre waters of terminal illness. His sister Connie, of course, is battling cancer doctors have told her she will not beat. The brother and sister have become well-known faces for their fundraising. 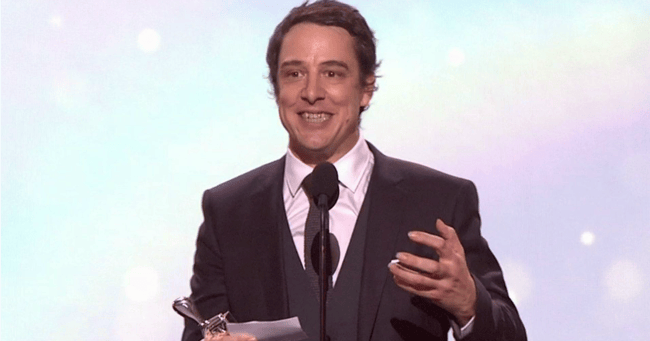 On Sunday, when accepting his second award for his portrayal of Molly Meldrum, Johnson spoke of Love Your Sister in what has come to be a familiar public declaration of support for the mum-of-two. “On behalf of my beautiful sister Connie, I would like to urge any family watching affected by cancer or not to join us in our quest to keep our families safe from the terrors of cancer. But behind the bright lights of the small screen and the occasional trappings of fame, Samuel Johnson’s life has been marred by the kind of grief normally exclusive to the dramatic story lines he brings to life. Suicide being the the tragic thread the binds so much of his loss together. When Johnson was just one, and being raised – alongside his two sisters – by his parents in Daylesford, his mother suicided. In an interview with Australian Story in 2008, Johnson’s sister Hilda said he spent much of his life looking for people who knew his mother. Connie and Samuel Johnson. Image: Facebook. "He found himself being drawn to people that were in his mother, well in our mother’s life, like the guy from the local pub. He got a job there a couple of nights a week," she told the program. At age 15, he would be cast in a short film with a fellow actor of a similar age called Heather. Heather and Johnson, alongside a woman called Sarah Hallam, who Johnson would go on to date, became a kind-of-trio. They were "great friends", according to Hallam, and grew very close. By the end of 2005, and when Johnson was 27, his close friend Heather had died by suicide. The loss affected both himself and Hallam greatly. At the time, he had a girlfriend. Her name was Lainie Woodlands and the couple were living together. Two months later, Lainie, too, was dead. She had been battling long-term mental health issues, and life came into sharp focus for Johnson when Woodlands passed in 2006. Talking to Meshel Laurie about the loss of his girlfriend in her podcast The Nitty Gritty Committee in 2015, Johnson gave insight into how great a loss it was, describing the 20-year-old as "boisterous", "fun-loving" and "full of smiles". “I met and fell in love with a beautiful young lady called Lainie,” he told Laurie. “She was a bit too amazing though and I couldn’t quite handle it so I kind of bailed on her and then she killed herself..."
He’s had to make a conscious decision not to blame himself for her death. “I knew I wasn’t the cause,” he said. Meshel Laurie&apos;s interview with Samuel Johnson. Post continues after audio. Alongside his late girlfriend&apos;s mum, Johnson ended up in court fighting for Woodlands&apos; body to be buried in Daylesford - her father wanted her buried in Sydney. Compounding the death was court costs, time and energy, and it left the actor in what he has since called "a very dark place". "When someone takes their own life, you know, you live forever without any of those questions getting answered. And you have to come to terms with the fact that there’s no single answer," he told Australian Story back in 2008. In an interview with ABC Radio at about the same time, he revealed, quite candidly, the kind of effect consistent tragedy has. "The three key women in my life have left me. It floored me. You know, I mean, it&apos;s still floored me. It&apos;s just ruined me emotionally and I&apos;m very sad now."